A 31-year-old woman was told last Wednesday at Craigavon Magistrates Court if she continues drinking the way she is she will not see 40 years of age. 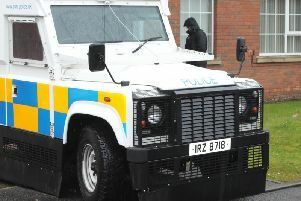 Elizabeth Marks, Atkinson Avenue, Portadown, was charged with two disorderly behaviour offences. The court heard that on February 21 this year at 1.30am a police mobile patrol in Market Street, Portadown, saw three males and a female in the middle of the road. Two males were trying to get her off the road but Marks, who was intoxicated, began shouting and swearing loudly. She said ‘f—k off’ and ‘f—k you’ to police and when she was put in the police vehicle struck the rear passenger side panel with her fist. On September 14 this year at 1.15am in Hartfield Avenue, Portadown, police found her lying on the steps of a house. Marks was intoxicated and shouted at police ‘black –b—ds’ ‘hurry the f—k up’ and ‘I’m going to jump on you’. She spat in the face of an officer as she was getting into the vehicle and then spat in the car. Mr Richard Monteith, representing the defendant, said the first offence was verbal abuse while the second started as that then spiralled into spitting in an officer’s face. He added that if she got some help and took that help it would do her some good. District Judge, Mrs Bernie Kelly, said one of the saddest parts of the case was that the defendant was very young to make herself out an alcoholic. The judge said she was going to take a risk and impose a community based disposal. She imposed a 12 month probation order with the condition the defendant takes part in an alcohol and drug treatment counselling programme. But she warned Marks if she did not co-operate and the matter was brought back to court the order would be replaced with immediate custody.